One of the biggest problems in our society is knee pain. Seeing people in the older population having knee replacements is something that is becoming more and more common every day. Unfortunately knee issues aren’t just affecting the older population. These days more and more people in all age groups are complaining of knee pain and have no idea why the pain has started, what they did to cause the pain, or how to overcome the pain. Before we go any further we need to understand the types of knee pains/injuries. Knee injuries can come in two different packages; acute or chronic. If someone was to have an acute knee injury we are talking about a knee injury that happens instantaneously. This could be a torn ACL, MCL, or some type of meniscal tear. Acute injuries can happen do to contact (think football player that gets his leg caught in a pile and rolled up on) or a non-contact injury (think football player that stops, cuts quickly or plants thier foot in the ground and goes down with a torn ACL). A chronic knee injury is when there is no damage to the interior knee structure. More often than not a person will complain of a general, localized pain. Most of the time these injuries occur due to poor movement patterns or a repetitive overuse issue. I would bet that most people that are complaining about knee issues fall into this category – if you tore your ACL or something of the like you probably would have known it the minute it happened. This may seem like something that we could classify in the ‘duh’ category, but many people flat out don’t have the proper strength and muscle function at the muscles surrounding the knee. Thankfully we can correct these issues. Unfortunately most people that go to the gym and perform some lower body exercises think they are doing themselves a favor but sometimes they are doing just the opposite. We’ll tackle specific exercises later on. The knee in most everyone naturally caves in (valgus knee) a little bit creating an angle between the hip and the knee (Q angle). 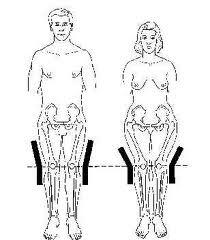 The more the knee caves the greater the angle between the hip and the knee is which is why women tend to have more knee issues than men (wider pelvis = greater angle between hip and knee). This is one of the biggest reasons we see a much greater rate of ACL injuries in college women as we do in college men – the Q angle is constantly putting women in a greater risk of knee injuries. This is where most people miss the boat, even doctors. A lot of knee issues are due to a decrease in mobility at the hip and/or at the ankle. If the hip has mobility issues then the knee will try to pick up the slack and help create the mobility that the lower body needs. The same goes for the ankle – if the ankle lacks mobility then the knee tries to pick up the slack. The problem is, the knee is a stable joint and when a stable joint tries to become a mobile joint, you can pretty much bet that pain in that stable joint is bound to follow. Again, this is kind of a no brainer. If you are constantly overloaded the knee, or any specific tissue for that matter, then there is a good chance pain is going to follow due to overuse. This can arise from trying to perform too much too soon, or just using too much volume and/or intensity in general. Its no wonder so many runners have knee issues – they place a ton of stress on their knees every time their foot strikes the ground. In the next part of this series we will look at some of the ways we can strength train to avoid knee injuries. Some of the movements may not be new to you, however I will all but guarantee that some of the movements will be something you have never seen before.